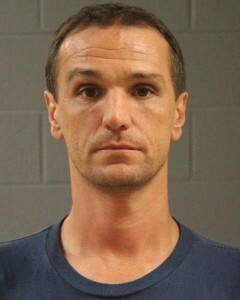 ST. GEORGE – A 42-year-old man was arrested Thursday and is now facing a second-degree felony, among other charges, after an alleged go-kart dispute with a 15-year-old boy at a family-fun center last week turned into a physical altercation. On Oct. 12, officers responded to Fiesta Fun, 171 E. 1160 South, in St. George around 10:20 p.m. on an assault incident where it was reported that a man and a juvenile were involved in an altercation, according to a probable cause statement filed by the St. George Police Department in support of the arrest. The man, later identified as Christopher Dee Muscato, of Henderson, Nevada, left the scene prior to officers’ arrival. After interviewing the juvenile and several witnesses at the scene, the statement said, officers learned that the incident began when Muscato and the juvenile had gotten into a verbal argument about issues that occurred on the go-kart track. During the argument, Muscato pushed the 15-year-old boy into a pole and then hit him in the face, according to the statement. In an attempt to defend himself, the boy began throwing punches at Muscato. A group of individuals at the family-fun center broke up the fight, at which point, Muscato left the area. However, the facility’s manager was able to locate Muscato’s payment transaction receipt to provide officers with his name. The next day, officers were able to speak with Muscato over the phone about the incident. Muscato went to the St. George Police Department and turned himself in Thursday and was booked into the Washington County Purgatory Correctional Facility. He has been charged with second-degree felony child abuse intentionally inflicting serious physical injury, a class B misdemeanor for criminal mischief causing intentional damage to property, along with an infraction for disorderly conduct. Muscato has since been released from custody on $10,680 bail. He is scheduled to make his next court appearance Tuesday afternoon. Sounds to me like the little punk needs to learn some manners. Sounds to me like he did learn something. Probably never had any discipline in all of his fifteen years. This little 15 year old punk is a punk. Unfortunately,, this 42 yr old needs to learn that you can’t throw the first punch no matter how young or old somebody is. Does anybody else notice how black this guys eyes are in the booking photo? The only thing this guy did wrong was letting somebody see him throw that punk down where he belongs. I hope all goes well for this guy. I don’t give a spit in the wind over that worthless 15 yr old punk. I hope his parents read these comments..
Geez people…calm down. This night of “family” fun ended badly. It’s hard to know what exactly happened. However, it does not excuse the older mans violence. I have also experienced a similar situation at Fiesta Fun without the violence on my end. After 8 PM the freaks come out and all they care about are themselves. Perhaps Fiesta Fun should hire Security that is older than 18 that can actually provide a safe “fun” environment for the whole family. It’s not called “Fiesta Teen Center”. Common Sense sounds like the only person posting on here that has any common sense. Nothing excuses this man punching a 15 year old in the face. We all know that teenagers don’t always use the best judgment, they can be mouthy, they can be disrespectful. None of these things warrants punching them in the face. We don’t know the full story, all of the witnesses are saying something very different than what this guy said. He is facing felony charges, obviously he is going to downplay what he did and make it sound like the boy was a whole lot worse than he was. Don’t judge the boy unless you know him personally. Krisp…. Pffffft that’s your opinion and that’s all it is. Leave it to SGPD to show no discretion and charge this guy with everthing they could think of. I don’t care how old you are you talk trash to my wife you deserve to get roughed up.